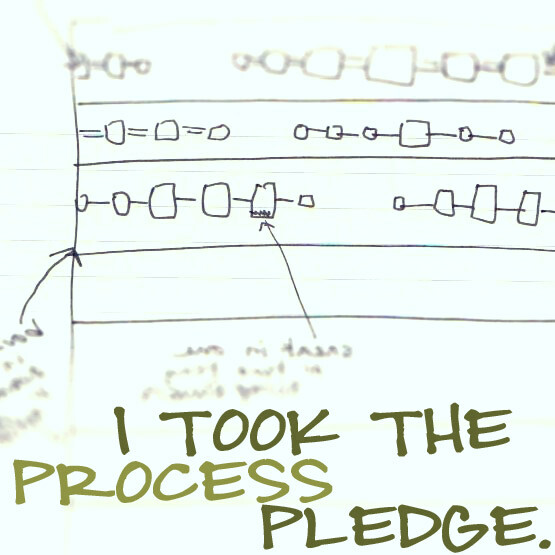 Tallgrass Prairie Studio has a new “challenge” for us – at least, it’s a challenge for me. 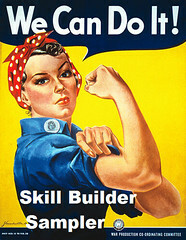 Count up your unfinished projects, work like crazy during the month of April to finish them, then on April 30th go back and post a comment telling how many you finished. Each finish enters you in a drawing for really cool stuff. I have so many projects to finish, it’s sad. I am a starter, not a finisher. Halfway through a project I either get bored with it or I get excited about another project and go great guns on THAT one. Maybe this challenge will help. 1. Everything Old is New Again – the newest project, I need to finish this quickly because I’ve written a pattern for it. 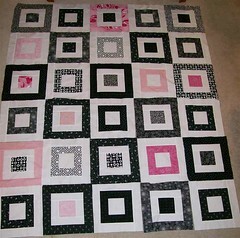 Once it’s done I’ll photograph it, update the pattern, and then take the quilt and pattern to my local quilt shop. She’ll buy some patterns, display the quilt, and sell kits. 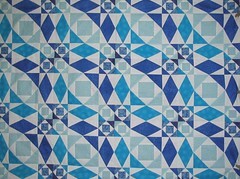 My mom is doing the same pattern in a different fabric line, so who knows, maybe the quilt shop will want both! In this case, money is a great motivator, since she’ll purchase the patterns up front. 2. String Quilt – All of the blocks are done, laid out, sewn together in four patches, picked up in order, rows numbered – all I have to do is add the sashing and the top is finished. 3. 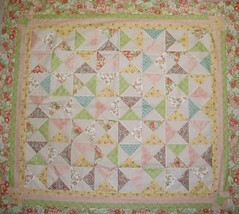 Flannel Quilt – I think it was three years ago that I started a simple flannel quilt for my cousin. It morphed a few times because of issues with flannel (I discovered that I do NOT like working with flannel! ), and I needed to add fabric. I have to figure out if I have everything I need to finish it, or if it has to morph once again. 4. 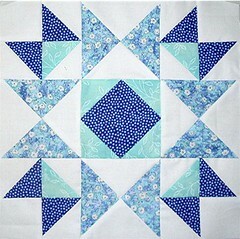 Family Star BOM – I have about 8 blocks out of the fifteen finished, so there’s a bit more work here, but Mom’s is done and on her bed, Karen’s is probably in the final stages, and Pat was working on the setting squares. I need to get in gear. 5. 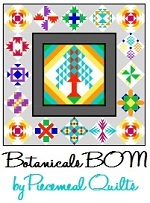 Quilt Shop BOM – This is a few years old. I joined a block of the month and worked diligently on my 18″ squares. I finished six, and the remaining six sit in little plastic bags, waiting to be finished. In my defense, I sashed the six finished ones and they’re hanging on a wall in our living room. Still, I need to complete the other blocks and either take it down and turn it into a real quilt, or make throw pillows out of them. 6. 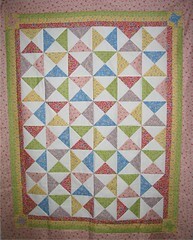 Bright Jacob’s Ladder – It just needs two borders and then it’s a nice little baby quilt. 7. 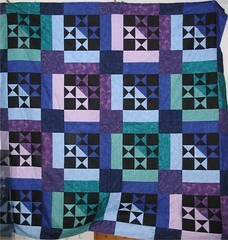 Storm at Sea – I love this quilt, and it was supposed to be finished at 12 blocks. It’s just that I put so much effort into this, and the 12 block version looks so small! 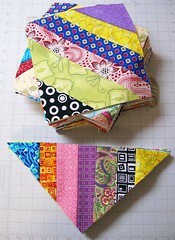 Either I make more blocks, or I figure out something interesting for borders. 8. Zigzags for Zoe – Technically this one hasn’t been started, so it really isn’t “unfinished.” I’d like to make a “baby” quilt – okay, CHILD’S quilt – for the first cousin’s baby. 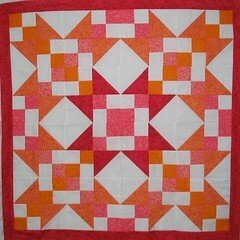 She’s a bright, energetic child, so I wanted to make a bright, energetic quilt. I came across the simple two-rails on point version of a zigzag quilt at crazymomquilts, and I have everything I need to do it. It should be fast… but is this a case of getting sidetracked by yet another new project? 9. Good & Plenty Quilt – Top is done – this is for the neighbor’s daughter’s graduation in May. 10. 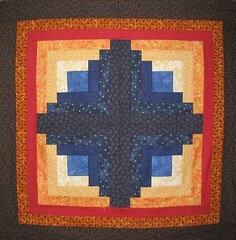 Brother’s Quilt – This was a Christmas gift… FOUR years ago. 11. Aunt’s Quilt – I showed her the top before Christmas last year, hoping that her knowing about it would be an incentive to finish it. Hasn’t happened. I did fix the block that was turned wrong, though. 12. TWO baby quilts – I made hourglass tops for the daughters of two of my cousins, and here they sit. The “babies” are two or three years old. 13. My throw – Quilt it before I no longer like the fabrics! 14. 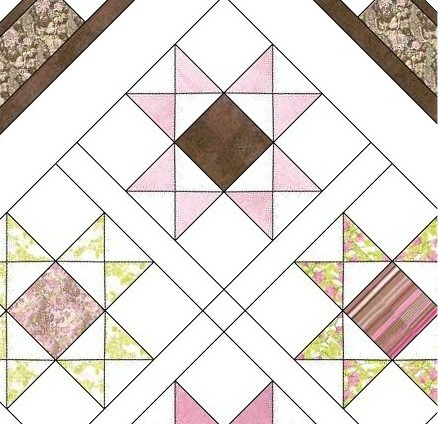 Log Cabin Wall Quilt – Four simple blocks, perfect for a wall hanging. 15. 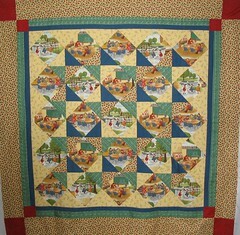 Class Quilt – My very first quilt, a sampler that is pieced, bordered, layered and partially quilted. I played with free motion quilting on my standard machine and it looks awful. It’s been hanging around collecting dust and cat hair every since. Yikes, now that’s a list. I thought mine would be about that long as well. I hope you get a good portion of your list accomplished. That’s quite the list, but I’m sure you can make great progress during the month of April. I especially love your brother’s quilt. Have fun!